This is the book that has helped thousands of consultants all over the world document their systems, their clients, and their processes. 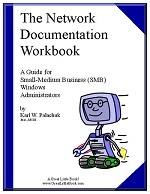 After five years of amazing sales, The Network Documentation Workbook is now a download product you can start using today. Are you a Computer Consulant or an experienced technician making the move to managed services? This is the perfect book for you! The book includes step-by-step instructions for documenting networks, and all the forms you need to get started today. SMB IT Professionals Group and author of several books, including . . .
Karl has been a featured speaker at conferences and seminars over the last ten years. He is a Microsoft Certified Systems Engineer with a Bachelor's Degree from Gonzaga University and a Master's Degree from The University of Michigan. He is also a Microsoft Small Business Specialist, and is an original member of Microsoft’s Small Business Specialist Advisory Panel. I have used it on several networks and I have been pleased with the way it has forced me to reduce to writing many pieces of information that I once carried around in my head. My clients appreciate the results, as do I. "An essential, handy, ready-to-use reference with immediate ROI — because you don't have to create the forms: Karl's done it for you." "The training provided in this book helps companies realize the value of technology." Please see Karl's Blog Post about this book. The Network Documentation Workbook came out of the standard procedures of KPEnterprises, a small business consulting firm in Sacramento, CA. 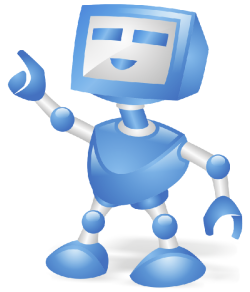 Karl has been a successful network consultant for more than twenty years. The "Consultant Edition" allows you to document all of your clients' networks. You get all the forms on CD-ROM in both Word and PDF format. 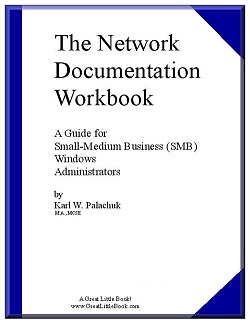 The Network Documentation Workbook was developed by Karl W. Palachuk, a successful entrepreneur, network consultant with more than 20 years in the business. In this workbook, Karl presents the forms he has developed over the years to document his clients' networks. Karl's approach is to create a binder that includes all the important documentation for your network: Windows domain information, server configurations, IP addressing, password — Everything! You'll get everything from a Table of Contents to a Monthly Maintenance Checklist, all ready to be copied into your binder. Copyright ® 2011-2012 Great Little Book Publishing Co., Inc.